Richard Ridlington’s inconvenient marriage saves his skin. His new wife Cressida has been blackmailed into it as well, but together they find their way to their new home in Devon. Is there a chance for love when a mystery needs solving, a ghost needs their help…and they mustn’t forget to walk the dog? $0.99 on Kindle. While their crusade for London’s poor unites them more deeply than they could imagine, Amanda and Nathaniel struggle to trust one another with their true identities. But when the call to action leads Amanda into the path of danger, she can only hope that Nathaniel will see through her frivolous pretense. Because now, only the aid of the suitor she loves most—but trusts least—can save her. $0.99 on Kindle. 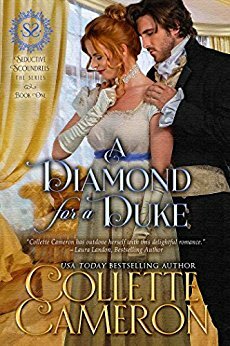 This Historical Regency Romance contains a duke who literally thumbs his nose at society, a sweet and intelligent wallflower with a secret dream, a villainess worthy of a fairy tale, and two delightful match-making dowagers. $0.99 on Kindle. Being a Vicar doesn’t protect Simon Ridlington from the emotions that erupt when he meets Tabitha Worsley once again. Thrust together by circumstance, they weather a broken arm, a shocking scandal, an unexpected dead body—and the growing desire between them. 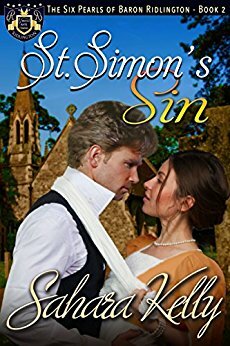 Can their love save St. Simon’s…and each other? $0.99 on Kindle. 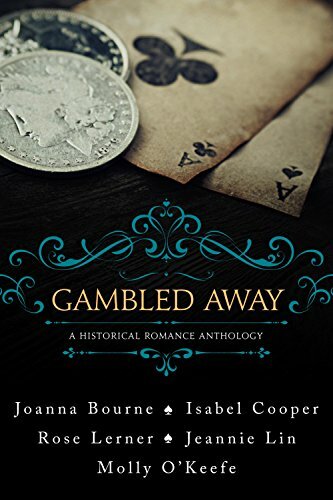 Spanning centuries and continents, five brand-new novellas from beloved historical romance authors tell the stories of men and women who find themselves wagered in a game of chance and are forced to play for the highest stakes of all: love. $0.99 on Kindle. Red never shies away from a challenge. Never. But when Miss Hannah St. John strides into his life demanding—yes, demanding—he help her, he’s certain she’s more challenge than even he can handle. Carting a cursed stone across the country with a know-it-all woman is not Red’s idea of fun, particularly when their journey runs far from smoothly…so why does he find himself enjoying her company just a little too much? $0.99 on Kindle. Lust, gluttony, greed, sloth, wrath, envy and pride. The Cynfell Brothers are the very embodiment of a sinful existence. But could the right woman change that? $0.99 on Kindle. 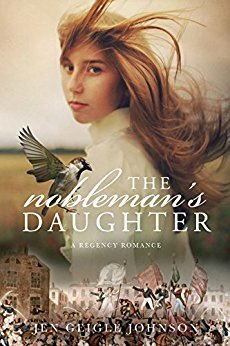 A Regency-set historical romance… Sometimes the worst of circumstances can have the best results. It’s certainly true for Miss Léonie Girard, whose missing memory might hold the answers to some dangerous puzzles. Delaney Deverell doesn’t know that yet; he’s still stunned that the portrait on his wall has come to life…and she is staying in his house. $0.99 on Kindle. Avalon Society member, Micah Wychcombe, and Libby Darrington find themselves in a compromising situation. Micah offers for Libby out of gentlemanly duty and honor. 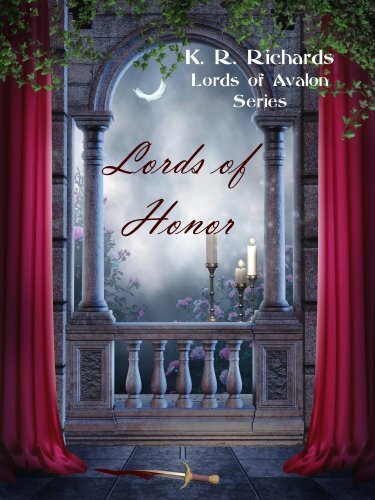 In another situation that involves honor, Lyon Ravenscroft must offer for Miss Sophia Hart. The Avalon Society is being pursued by dangerous men after their recent finds in Glastonbury and will stop at nothing to get them. Free on Kindle. Practiced rake Roman Alexander never meant to seduce his best friend’s sister. He certainly never intends to do it again. The handsome scoundrel has never felt more compelled to be a better man. But the damage has been done, for his buttoned-up spinster refuses to marry a bounder like him—and maddeningly, she doesn’t seem to like him. Nevertheless, he can’t seem to forget her, or her passionate response to his kisses. How much danger could there be in one more try? Practical headmistress Lucy Lancester naively believes her charming rogue has moved on to his next conquest, leaving her free to cherish their one night together for the rest of her bluestocking days. Until the afternoon he arrives at her school intent on proving their one night together wasn’t enough—and this time, the scandal can’t be contained. Well, two can play at that. How hard can it be to ruin a rake? $3.99 on Kindle. Trevan Chynoweth returns to Cornwall to find his impatient fiancée, Wenna Penrose, promised to another man. Trevan is not willing to give up his long-time love. Meanwhile, his cousin, Gabriel Chynoweth, fights his sudden, physical attraction to Wenna’s sister, Senny, a woman whom he has always regarded as a dear friend and sister. Jack Drayton, the Earl of Elveston, has long been attracted to Lady Tuesday Inwood. Knowing the only way he could have her is with an offer of marriage has been enough to stop him from pursuing her, until now. In Cornwall, the Avalon Society discovers another clue that leads to an important relic while translating ancient scrolls recently found in Glastonbury. The Society’s opponents, the Knights of the Brown Order, are determined to find the Holiest of relics first. They will do anything to get to it before the Avalon Society does. Free on Kindle. The attraction between Sarah and Jamie is instant and powerful, yet each has something to prove, if only to themselves. Will their single-minded determination derail a blossoming romance? Free on Kindle. When their loved ones and families become targets, the Avalon Society members must join forces with the Crown to stop mysterious brown-coated men who have been attacking them. Can the memebers discover the identities of the leaders and stop the attacks? Will two newlywed couples find happiness in their unforeseen circumstances? $0.99 on Kindle. From nationally bestselling author Kristina Cook comes an award-winning historical romance set in Regency England–first time in digital! Widow Gail Saunders is struggling to support her eight-year-old son, Nicky, by running a small riding school when the Earl of Savile arrives to tell her that Nicky has unexpectedly inherited money from Savile’s cousin. Gail and Nicky spend the summer at Savile Castle, where Gail falls in love with the charming Raoul, a man as far above her in social station as the sun is to the earth. To add to her troubles, someone seems to be trying to kill Nicky. The threads of the story unwind to an unexpected yet satisfying conclusion (which I am not about to reveal here!). The dialogue is priceless. The story complex….You will love all the wonderful characters and the sizzling storyline….Ms. Wolf is a master. Another winner…wonderfully written….Whether your favorite Joan Wolf story features Regency heroes, strong heroines, or marvelous Regency era settings, you’ll find it all here in The Arrangement. It will keep the reader absorbed from beginning to end….This perfectly paced story leads the reader,,,through a harrowing search for the truth….The riveting narrative…will delight readers everywhere! In 1943, the women of America banded together to make a life for themselves while their husbands and sons fought overseas. Evan as the men engaged in war, these women faced battles of their own on the homefront. Margo King: A woman whose past threatens to control her future. Dottie King: one passionate mistake could destroy her dreams. Lucy Andersen: Lonely and afraid, she turns to another while her husband is away. Penny Maxfield: Desperate for a new life, nothing – not even her family – can hold her back. Margo, Dottie, Lucy, and Penny never expected to face the hardships they must now find a way to conquer. But through the power of Christ, and the power of friendship, perhaps this Victory Club will achieve more than any of them could ever have imagined.